Eating a healthy diet is the main ingredient for sustaining healthy hair and hair growth. Silky and vibrant hair depends on foods for healthy hair. How to maintain that balance is a question many of us have. 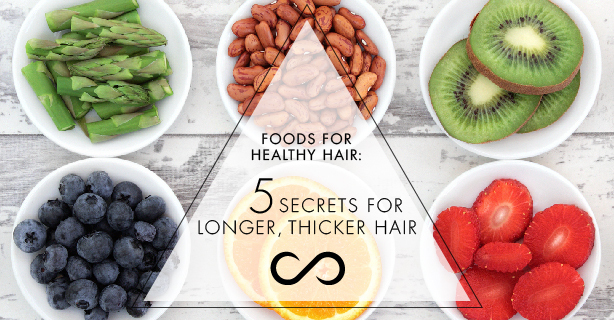 The following 5 tips can help unlock the secret to a healthy diet and help you to achieve the hair you have always wanted. Have you ever wondered why shampoo or hair conditioner that contains more protein is believed to be better for your hair? It is because protein is important for cell growth throughout your body. Protein is essential for tissue repair and the formation of new tissue. The health and wellness of hair, skin, muscles, eyes and nails depends greatly on the amount of protein your body receives from your diet. As your hair is structured mostly from proteins, if it is thinning or becoming weak or easy to break, you know it’s time to add more protein to your diet. When you consume food that is rich in protein, your hair receives the nutrients it needs to remain strong and healthy. A great source of protein can be found in foods for healthy hair such as beans, lentils, eggs, meat and tofu. Want to try something new? The borlotti bean is full of protein, which is an essential nutrient which helps form the structural component of body tissues and building muscle. It is classified as a high-quality protein because the bean contains all the nine essential amino acids that can only be obtained through consumption. One cup of borletti beans contains 17 grams of protein. Want even more of a “boost”? HAIRFINITY Volume Builder Amino Acid Booster gives hair an infusion of protein-rich amino acids. Support your hair with these natural building blocks for healthy, strong hair. Hair thinning and hair loss can be very frustrating and stressful for us women. Many of us don’t realize that iron deficiency is one of the main reasons for hair loss. As women, we are more prone to iron deficiency than men. Therefore, it is even more important for us to include iron-rich foods for healthy hair in our diet to prevent hair loss. By consuming foods such as red meat, dark and leafy vegetables, beans and lentils, tofu, black-eyed peas and chickpeas, clams and oyster, raisins and liver, you can slowly bring back your iron back to a healthy level and improve your hair’s health. A diet that does not provide your body adequate vitamins and minerals can also affect your hair’s health. It is recommended that we pay attention to our daily fruit and vegetable consumption to make sure we receive the vitamins and minerals we need. Vitamin C is one of the most important elements for maintaining healthy and beautiful hair. It plays a large role in keeping your scalp healthy and supports hair growth. It also helps with the absorption of iron from plant foods. Foods that contain a lot of vitamin C are orange, broccoli, berries, tomatoes, kiwi, grapefruits and other citrus fruits. B-complex (biotin, niacin and cobalamin) help add shine and makes your hair grow thicker and fuller. Whole grains, eggs, avocados are the food that rich in B-complex vitamins. Vitamin D is also essential to maintaining healthy hair follicles. It stimulates hair growth and regulates the cycle of your hair follicle. Thus, a lack of vitamin D in your diet is also a reason for hair loss. We often read that sunlight is a great source of vitamin D for your body. However, it is also important that you increase your food consumption of those that contains high levels of vitamin D if you don’t spend enough time outdoors or if don’t get enough sunlight in the winter. Salmon, soy milk, milk, eggs and Swiss cheese are rich in vitamin D.
In terms of minerals, zinc plays a large role in promoting body and your hair growth. Zinc helps to accelerate the renewal of hair follicles and skin. Thin and dull hair is often the result of zinc deficiency. Insufficient zinc levels also leads to the early appearance of grey hair. Seafood is one of the highest sources of zinc. Zinc is also found in beef and lamb, chicken and pork as well as pumpkin seeds, cocoa and chocolate. These are great foods for healthy hair. Omega-3 is known for its great benefits for your cardiovascular health but did you know that it also plays a large role in keeping your hair strong and beautiful? Omega-3 helps treat your dry and brittle hair as well as a flaky and itchy scalp. Your hair’s elasticity and strength are enhanced by omega-3. Last but not least, omega-3, like the rest of the important vitamins and minerals we have mentioned, helps your hair to grow stronger and faster. Flax seeds, flax seed oil, salmon, chia seeds and other types of fish are great source of omega-3 that can be easily added to your diet. Not getting all you need? HAIRFINITY Intense Shine EFA Booster gives you hair a boost of Omega 6, an essential fatty acid for shinier, softer-looking hair. As you can see, in order for us to achieve the hair that we always wanted, we have to make a lot of changes to our diet and include foods for healthy hair. However, with our busy lifestyle, it is very rare for us to be able to consume the daily requirements of essential vitamins and nutrients. Other external and internal factors such as pollution, stress, alcohol, medications and chemicals used in the food industry also diminish the nutritional value of the food we consume. It is vital that we add good source of supplements to our diet. Hairfinity hair vitamins provide you with a full body solution to healthy hair and skin. It contains ingredients that are high in antioxidant benefits such as biotin, hydrolyzed collagen, silica and MSM, which help reproduce healthy skin cells and promote hair growth. In addition to these tips that you can use as a guideline to change your diet and achieve the result you have been looking for, you should also pay great attention to your hair products such as hair shampoos and conditioners. Hair products that contain sulfates, silicons mineral oil and petroleum can greatly affect your hair health and should be avoided. HAIRFINITY Haircare line includes a gentle a cleansing shampoo with a base of Aloe Vera gel. This shampoo provides you the benefits of healing and moisturizing properties with a rich lather and a light, refreshing scent. When it comes to conditioners, the HAIRFINITY Advanced Haircare line has two conditioners. The first, our Balance Moisture Conditioner, which does just what the name indicates, provides moisture to keep your hair properly hydrated. The other is a deep conditioning masque that will leave your strengthen and revitalize your hair. These treatments will help restore moisture lost during chemical treatments and heat styling, adding to your hair the protein and nutrients it needs to grow strong and shiny. Having shiny and gorgeous long hair is a process that requires you to make a change from within, starting with your diet and lifestyle. By following these simple tips, you are taking your first step to a healthier lifestyle and on your way to achieving the skin and hair that you always wanted. Although adding great sources of vitamins including hair growth vitamins & minerals to your diet is excellent, you should also pay special attention to the kind of supplements and products you are using. Make the change today and see the transformation in your hair, skin and overall health! Hairfinity healthy hair vitamins is transforming the hair of women all over the world with a unique blend of vitamins, nutrients, and our exclusive Capilsana™ Complex. Users of Hairfinity have reported improved manageability and overall appearance. Order Hairfinity Hair Vitamins today.